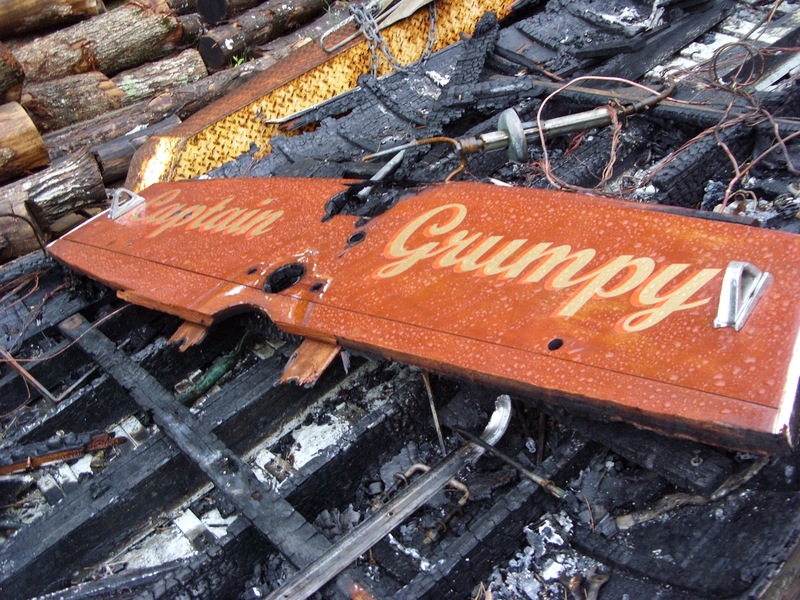 As part of Misery week here at Woody Boater we used a wonderful image of a boat burning provided to us by Mr Misery himself. Captain Grumpy… I wonder how he got that name? Yes not only did we get to enjoy Randy Rush’s hell yesterday, but we get to now live in his shoes one more time! 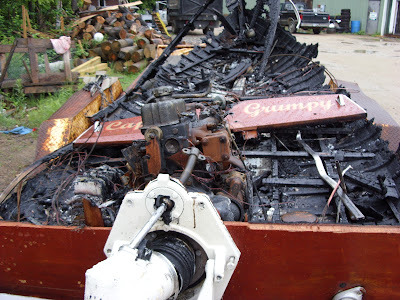 Here is the story of the burning boat in Randy’s own words. The boat burning in the header is…was my 61 Cruisers inc, 18′ with a Volvo out drive. Bought it on eBay for a whole $1012.00 in Nov 07, stripped it and redid the drive . Put it in the water late march 08, drove pretty good, no real issues. 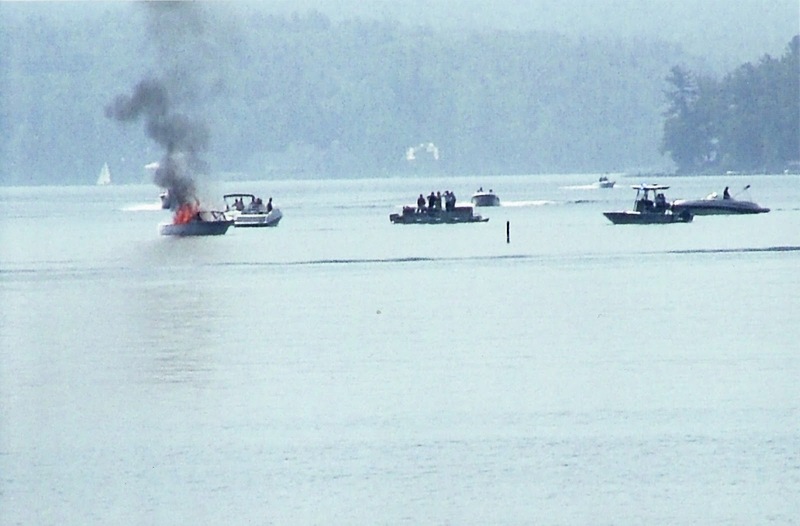 By now the entire back of the boat has 3′ flames, I go there extinguisher and see the boat drifting to shore-someones house, I try to throw the anchor out, but the flames are too intense, the guys on the pontoon are screaming at me to jump, so i did in the 54 degree water and swam for my life to their boat. 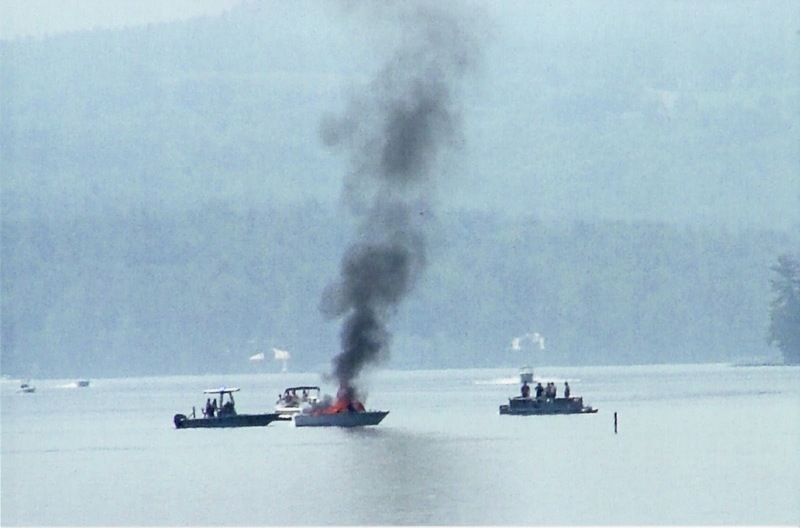 I sat on there boat and watched it burn for a half hour before the marine patrol picked me up.Funny thing about watching it burn it was like watching TV except on TV the boat blows up, mahogany just smolders. The chose to let it burn down to the water line. Then I called my wife to inform her I had a slight problem and to come get me. 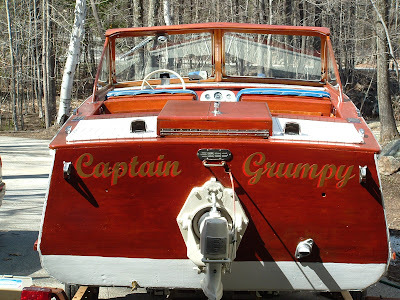 She drives our plastic boat over but cant figure out where (captain grumpy) our boat is. Then she sees the boat burned and sunk. The Marine patrol guy asks me what marine salvage company I want to clean it up. I responded , like I have a Marine Salvage company on speed dial!. So it cost the insurance company $7k for a barge with a crane to pull it out of the water and 3 divers to clean it up. The guys called me up and asked me if I wanted the transom as they thought the boat name was funny. So the transom is mounted on the wall of my garage, my wife wasn’t even pissed about her party her friends love telling the story, and I used a piece of the transom in the boat that just sunk. What do you think about that? This is all I have at work, I can send better pictures from home. 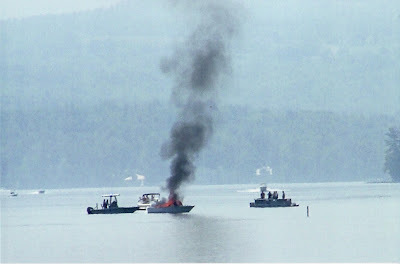 Also there is a small video on You-tube- boat burning on Lake Winnipesaukee that some guy took from the shore. Oh yeah that’s the same dock that I rented from the old lady.. The Little Ship Of Dunkirk UPDTATE - Baby Gar Junior in England Is Headed Back To The USA! Maybe instead of called her "the old lady" you need to start calling her "nicelady" (like Jackie Gleaason in "Smokey and the Bandit"). Thankee Nicelady. 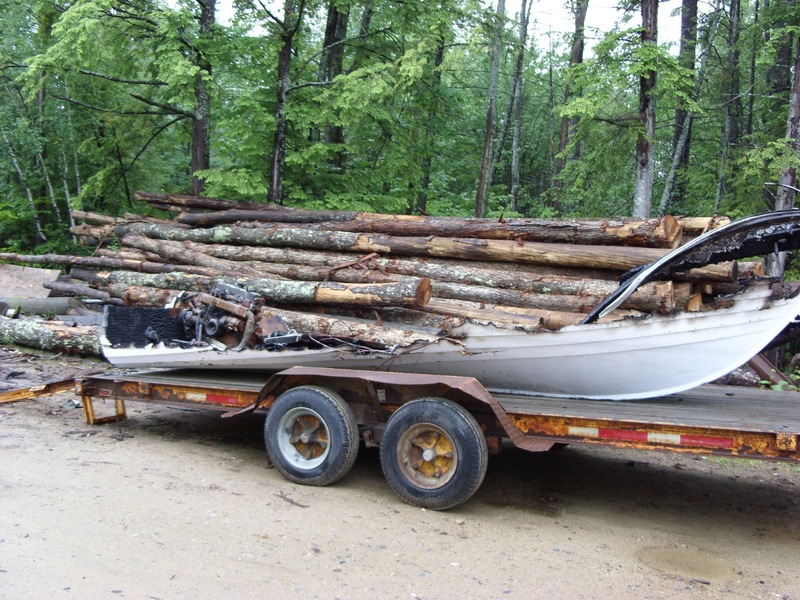 I think the story is almost worth more than you paid for the boat! 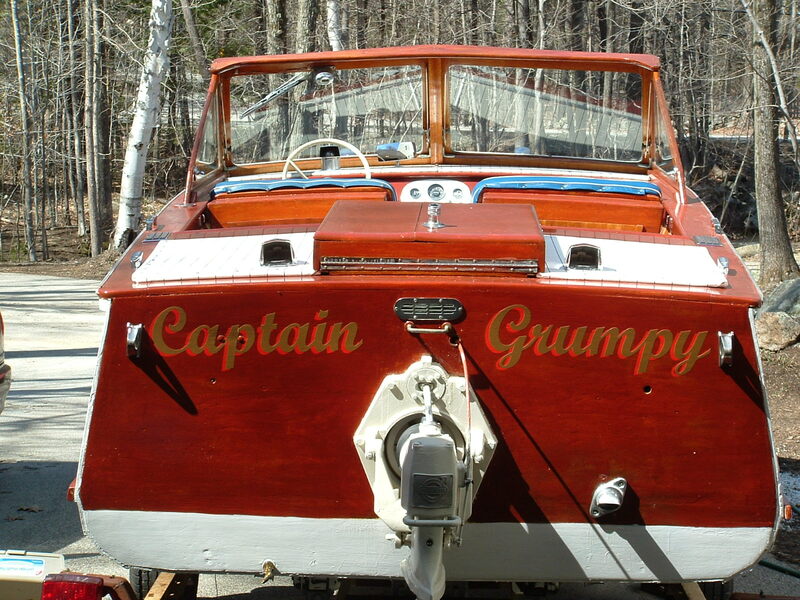 I love that you kept the transom, and can see some humor (slight)in the telling. I think we are a mostly indefatigable bunch, and Matt's theme this week give us a great chance to show it. 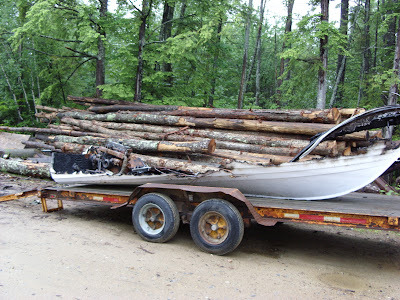 My experience with physical misfortunes and wood boats are mostly minor – the financial ones are another matter. You should have an axe on board so in such a dire set of circumstances you can scuttle her. Then fix the hole. Oh Yea don't forget the long painter. Pull the plug and scuttle her. Randy seems like a nice guy, but I don't know if I'd let him tie up for the night. Any clue as to exactly how the fire was ignited and from where the fuel was leaking? Blew the spark arrestor off the carb and just kept burning thru the carb. Then the fuel line just acted like a wick draining to the low spot in the back of the boat. They let it burn to the waterline because I only had 6 gal of gas . No mess in the water.